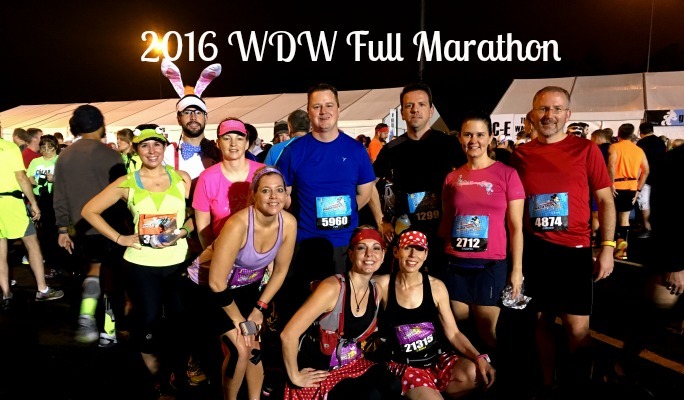 Our last and final day of the Dopey Challenge – the most intimidating part of the challenge – the 2016 WDW Marathon. This was also my first marathon. 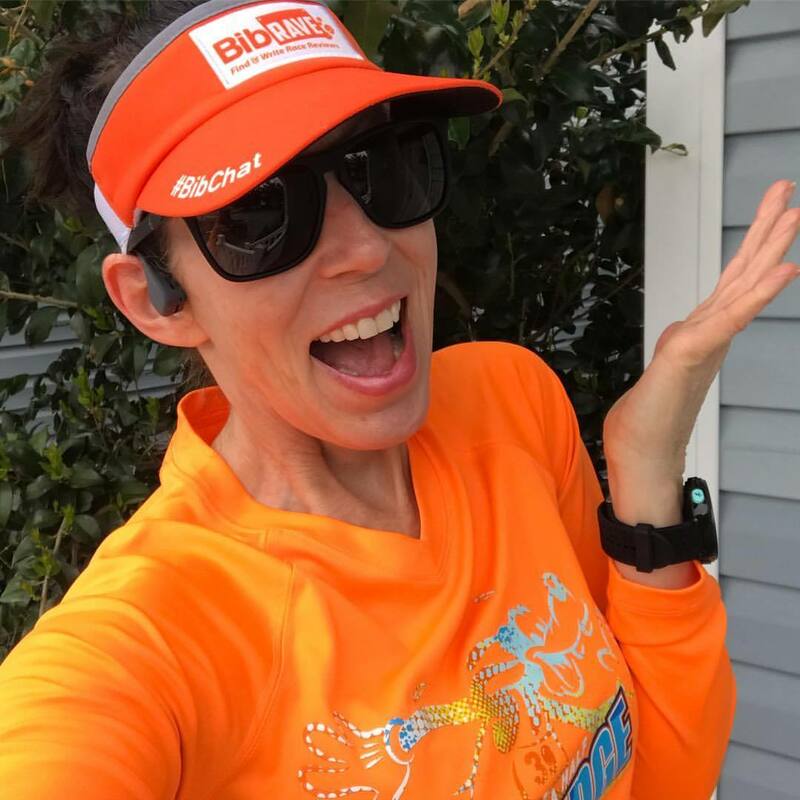 Running a marathon is tough, but combining with three prior days of running is crazy, but my motto was GO BIG OR GO HOME! 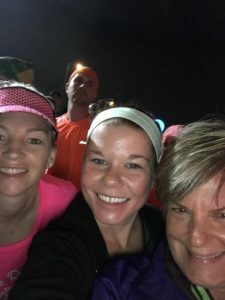 Continuing on from Laura’s recap of the WDW Half Marathon, we were ‘suitably rested’ as much as you can be after waking up at 2:45 AM for the last three mornings. At least most of us ‘rested’ our bodies the night before. After bag check lines the morning of the WDW Half Marathon, Laura made sure we were on the monorail with plenty of time to spare. Bag check was a breeze – maybe they learned from the day before or we just beat the crowds. We had plenty of time to get group and character photos prior to heading to our corrals. Here’s a picture of our larger group. 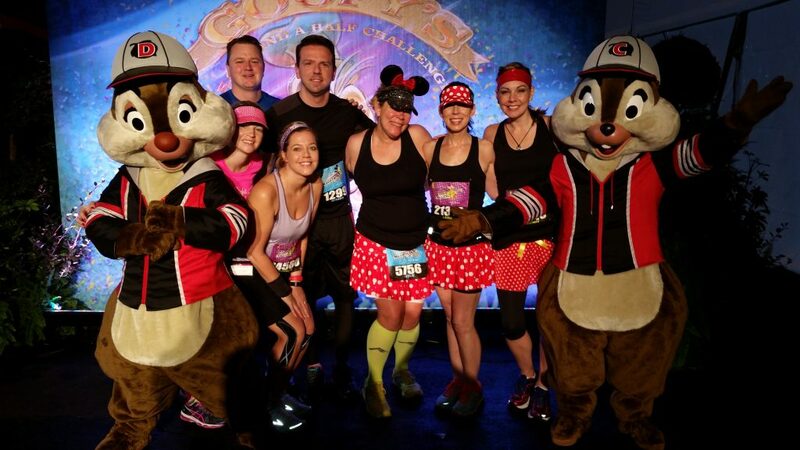 Like me, a few of our friends were also running their first marathon (just not as part of the Dopey Challenge). Pre-race photos character photos are the way to go – heck you look better (smell better too) and are able to walk or easily stand in lines. 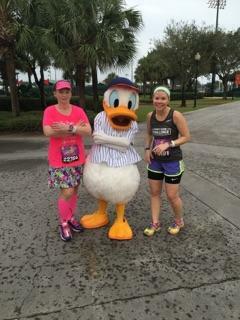 Pre-race picture with our main man DOPEY! I think Dale might have had too many acorns for a late night snack or early morning breakfast since I can barely be seen around his cheeks. It was soon time for us to head to our corrals and get serious. The weather was warmer than I would have liked – already mid 60’s at 4 AM, and the humidity was very thick. I was meeting my friend Brooke in the corral. She was there as part of Runner’s World and already in the corral. Brooke let me know she was in the very front. The corral was still very empty when I arrived so it wasn’t hard to make my way to her. We were even able to get a picture with one of the corral volunteers – shout out to the volunteers who make these races and weekend happen! Here’s our picture with our volunteer who kept the entry line in order and late comers from trying to jump ahead. While waiting, we noticed the 5 hour pacer in our corral. Despite us both thinking the same thing – wouldn’t a 5 hour time (for us) be great, I reminded her it was too warm and humid to achieve that AND we were going to stop for some pictures. It’s finally our turn, and we are at the start. I approached marathon day the same as each of the other four days of the challenge – one day, one race at a time. I had trained for this and finding time to train (with a full-time job and crazy kid schedules) was the hardest part. Brooke and I had discussed our strategy for our running and pace. I introduced her the art of interval run thanks to Jeff Galloway. Interval training was my life saver. I trained that way and then ran the 1/2 and full using a 90/30 interval. I felt good after the 1/2 and knew much of the marathon was going to be mental. Since I knew Laura and others would take mile marker pictures, we wouldn’t stop for them. The plan was to go out slow and start our intervals once it opened up a bit – so about a mile in the timer went on. We also discussed bathroom stops – meaning take advantage of those ‘in-the-park’ flushing toilets. I knew I would be seeing some familiar faces at the Magic Kingdom, and that pushed us to get up the crazy (overpass) by the Contemporary. Luckily for us, we hit a walk interval right when we were to go back up the hill. There is just something about running up Main Street with the castle lit that still sends chills through my entire body. 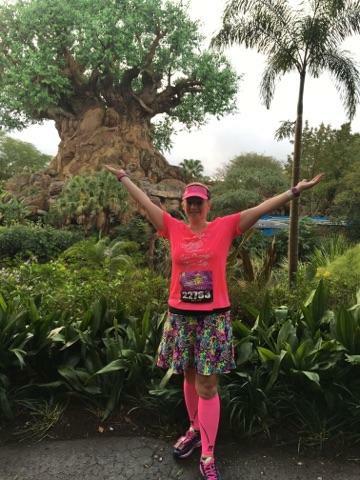 It doesn’t matter if it is the first time or the 10th – the feeling is, well, ‘just Magical’! 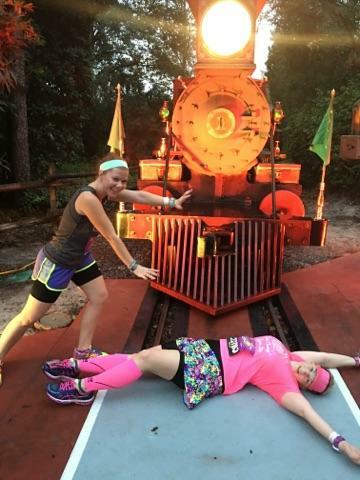 Up until this point, we hasn’t stopped for many pictures, but we couldn’t pass up a photo with the WDW train. I took one for the team here. Heading out of the Magic Kingdom we debated about stopping for Maleficent. 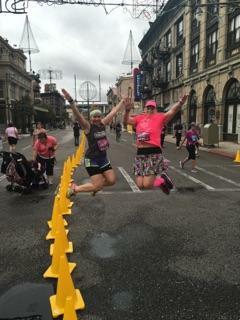 I do believe we actually ran past and then decided we just had to get a picture (without waiting in the long line). 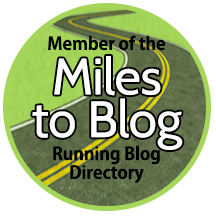 I didn’t really think about the number of miles remaining – just focused on the next park. As a result, we kept moving along with our intervals and kept to them as best as possible, especially in the congested areas. While on the long stretch of highway, I do remember wishing (probably complained) for overcast skies vs the sunny skies that kept poking out. Animal Kingdom was the next ‘landmark’. I knew I would also be about half way after leaving the park. We did not ride Everest as it was still about 30 minutes prior to the official opening of the park so there was no decision to be made. I don’t know if I would have wanted to stop. I was snacking at regular intervals, but this was the only time during the marathon that I didn’t feel that great. I think I had eaten too much at a time and decided to cut back to only 1/2 a waffle from here on out. The humidity was also a big factor so I took another salt tab – thanks Sage (and Anna for delivering). Another long stretch of highway was coming up. At this point, I think my interval timer was playing head games – it really seemed that the 30 second walk breaks were more like 10 seconds, but we kept on going. I didn’t want to be ‘that’ complainer – so we took the opportunity to stop at the gravediggers. Frankly, that’s how I felt at this particular point in the race. They didn’t want us to get down on the ground; I think it’s because they weren’t sure if we could get ourselves back up; but we were troopers. 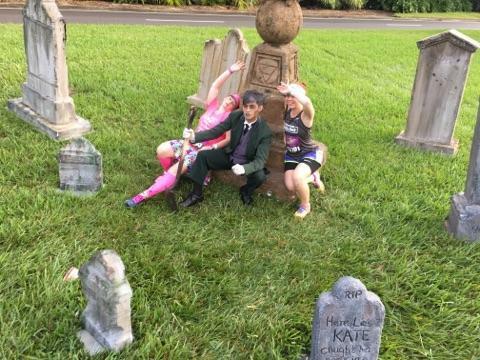 Not only did we survive the graveyard, but got a great selfie. So we kept on keeping on….as stopping was never an option. We had our huge marathon medal to hold as well as Goofy and Dopey medals. That along with the fact that everyone I knew (on Facebook) now knew I was doing this. Remember mile marker stops were not in my original plan. 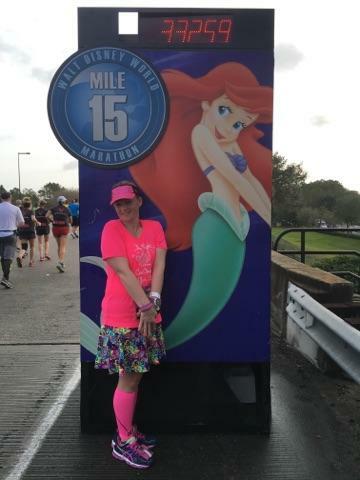 However, we did need to stop for important ones – for example Mile 15 with Ariel (Brooke’s favorite). It was mandatory to mimic the princess pose as well. Next up – ESPN Wide World of Sports. 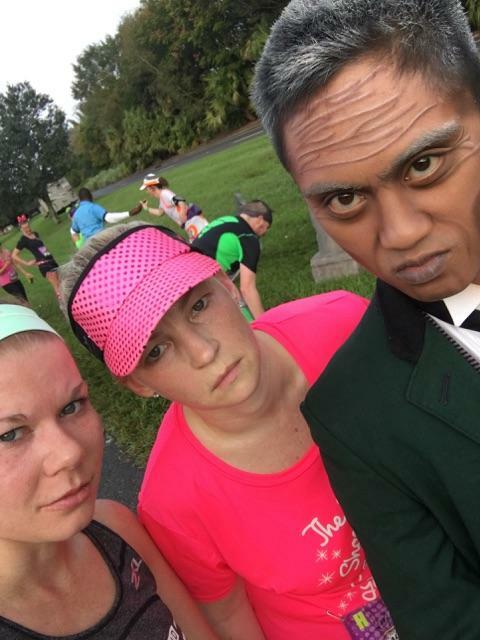 Past marathoners have a LOVE/HATE relationship with WWOS. It didn’t bother me too much – maybe because I was able to take advantage of another flushing bathroom. We also were given wet sponges (that were welcomed A LOT). We met up with Donald on our way to the stadium. It was at this point that I started to think about the number of miles I had already completed and how many I still had to go. I still felt ‘pretty good’ at this point. I remember running out of WWOS and saw so many runners turning. 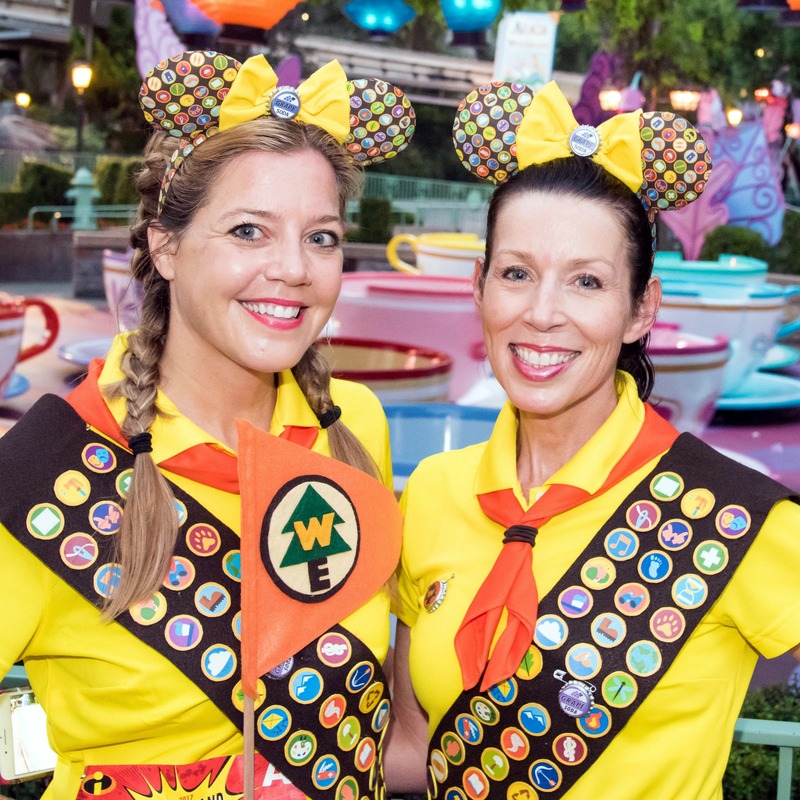 I said to Brooke – please tell me we aren’t looping around again and she assured me it was runners coming into WWOS. We were on our way out and headed into our final stretch of Hollywood Studios and Epcot. As we entered Hollywood, volunteers were handing out Dove chocolate squares. On any normal day, I would have jumped at that opportunity, but at that moment the thought of chocolate was quite unappealing and once again kept running. 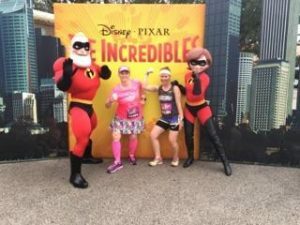 We couldn’t pass up the opportunity for a photo with the Incredibles because, frankly, we were almost done with a marathon and Day 4 of the Dopey Challenge which in itself is INCREDIBLE. Now, it did take a few tries to get the ‘right’ jump shot in the Streets of America. I will continue practicing my jump shot, especially when you run with and room with former cheerleaders. They can get some serious air. I am so going to miss the Streets of America. As we left Hollywood Studios we’re ‘almost’ done or at least that is what my head was telling me. This is sort of like when well-meaning spectators tell you that you are almost there when you still have 2 miles to go. 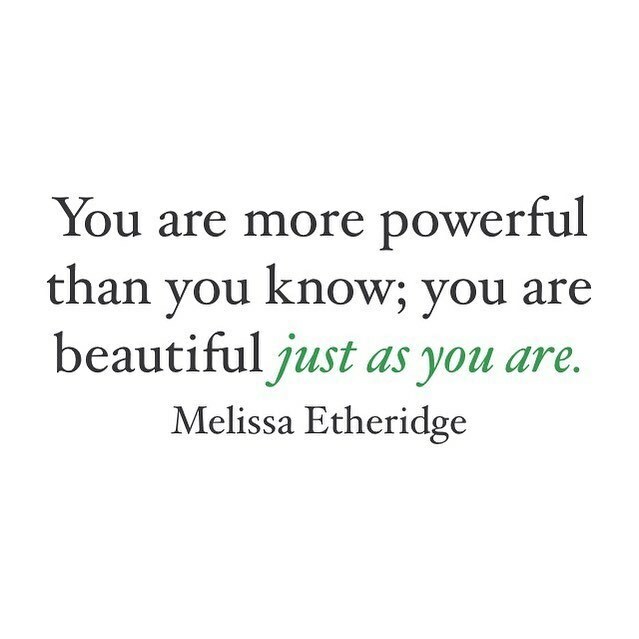 It seems like an encouraging comment – yeah not really. Remember, so much of this is mental! I knew there would be another group of friends along the boardwalk, and they were there with individualized snacks and Jell-o shots. So, if you haven’t figured it out, that wasn’t in my race plan, and I was too close to the finish to chance anything. I knew I could get beer (with my trusty Magic band) after I crossed the finish line and had ALL of my bling. I also knew there was an extra beer cup in my checked bag so I could get my refill for less $$. HINT: enjoy a beer during the expo and be sure to take the cup with you to the finish. Your wallet (or magic band) will thank you especially when you have to register for your next race. 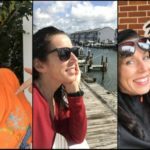 My verbalized (time) goal was under 6 hours (with stopping for pictures). I knew as we entered World Showcase that goal would not be an issue even if I walked the last 1.5 miles. One picture with Snow White in Germany was all we would stop for until we got to Spaceship Earth. We did end up taking a few minutes to get a decent jump shot again. Not that it was ever a question in my mind, but I was only minutes away from crossing the finish line of the race I said I would never do. 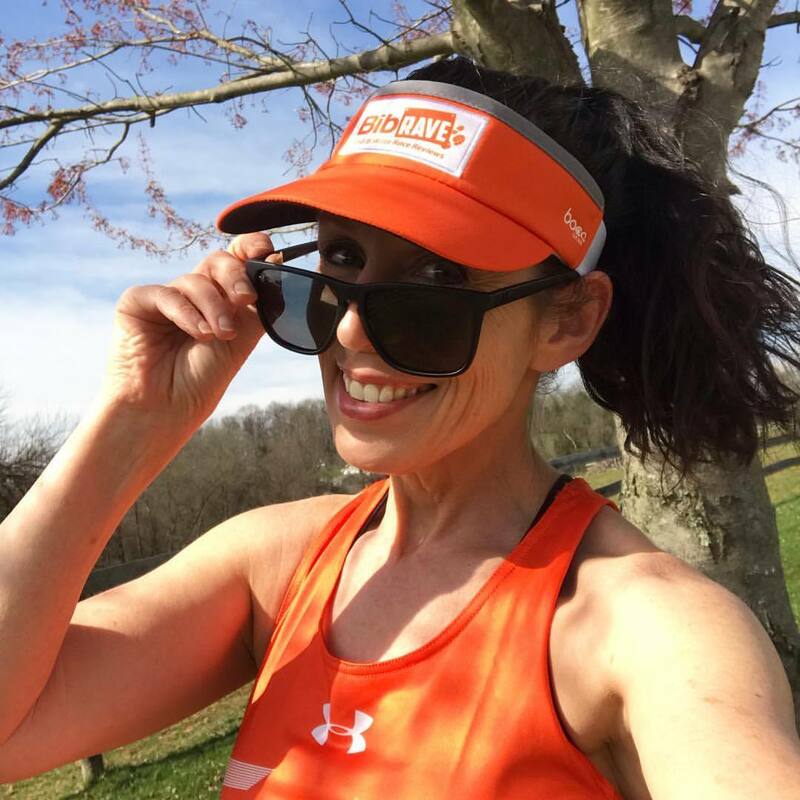 I am so glad we stopped for pictures along the way – for me, it’s about the journey and the experience, not my finishing time. 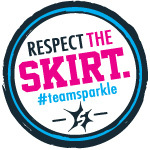 It’s an event I will remember for the rest of my life – the friendships, the training partners, the supporters along the way and the ultimate achievement of a goal. 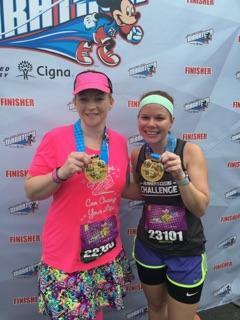 We did it, and as my shirt says, “the right shoes can change your life”! I had the time of my life doing the Dopey Challenge. Now it was time to finally enjoy some food and beer without having to worry about what I was going to eat before the next race. I was done! 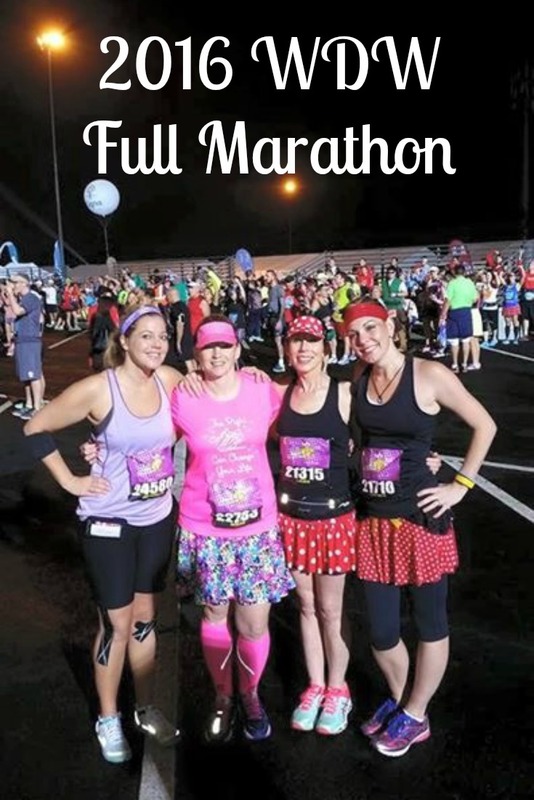 Here’s our full video Marathon recap from our Joyful Miles YouTube Channel in case you want to check it out. It’s a video like this that made me sign up for the Dopey Challenge in the first place. 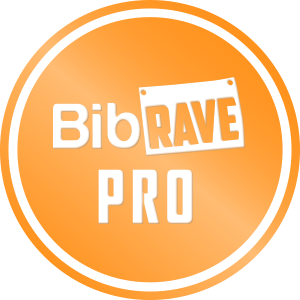 (You’ve been warned – watching can cause you to sign up for crazy races that you will LOVE and never regret). Enjoy! 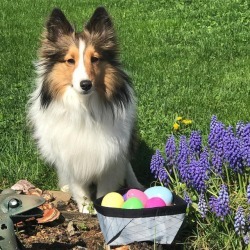 Thanks for reading and please subscribe if you’d like to be informed of new posts! 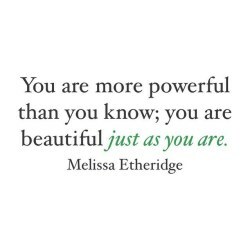 We are still in the initial phases of our blog, so we appreciate you reading. Great recap Meg!! LOVE your pictures…kind of makes me want to run again…. 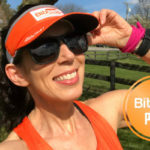 Great recap!!! 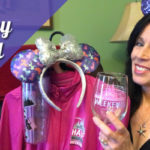 This coming up Wine & Dine will be my first Disney run and 2nd half marathon. 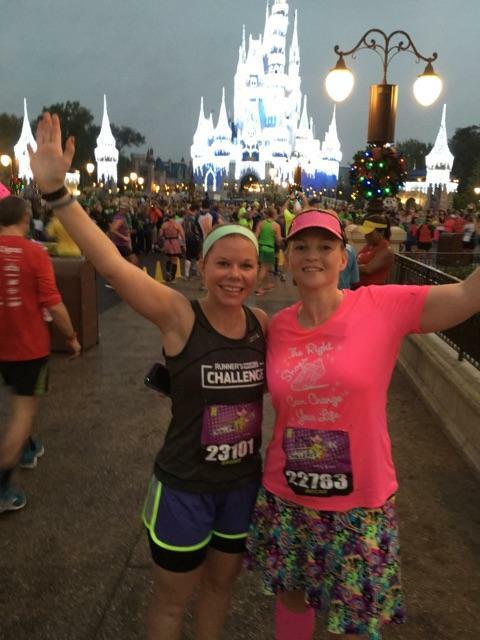 I’m doing the Lumiere’s Challenge…so excited!!! 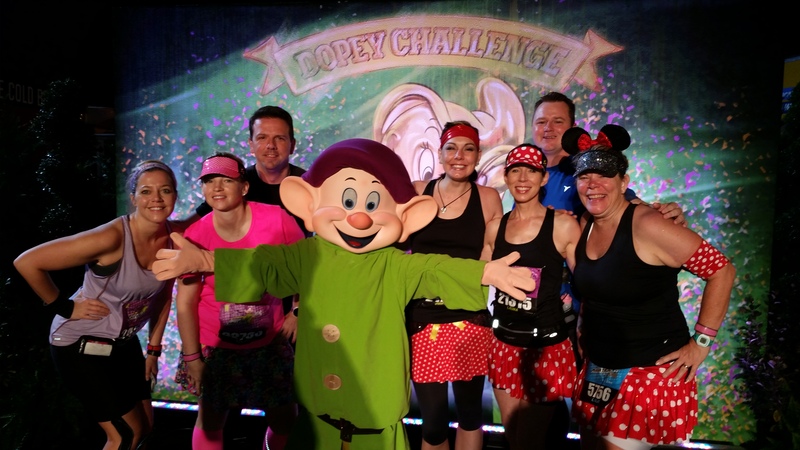 I’m already wanting to sign up for another one and I really want to do the Dopey Challenge! 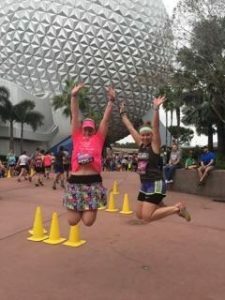 As this was your first marathon and you went BIG and completed Dopey, would you recommend doing the Dopey challenge for someone’s first marathon?? 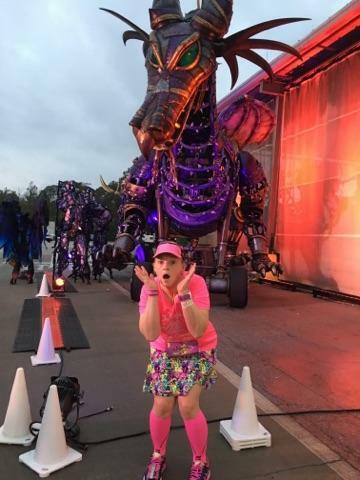 I don’t think I could complete a marathon without it being in Disney 🙂 Another question and this might be for the peeps that took all the mile marker pics, are the lines for these long? I’m starting in Corral J so will have tons of people ahead of me and I know, in general, the character lines will be long. Thanks! Hey Lauren, I hope you had an amazing time at Wine & Dine, it was a great weekend! 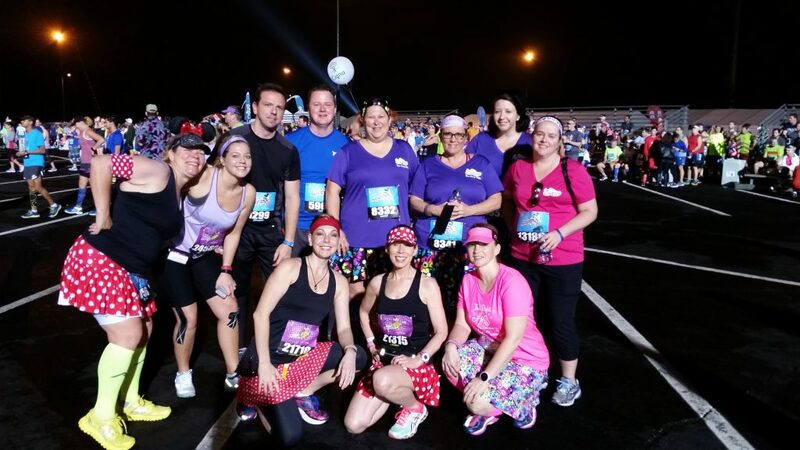 And yes, I absolutely would recommend Dopey as a first marathon, but only if you can stay dedicated to training since it is a serious athletic event. You will also have to be extremely vigilant to your nutritional needs by making sure eat enough, hydrate, etc. 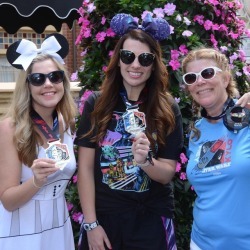 Megan did her first marathon during Dopey and Jackey and I for Goofy, and while it is extra challenge, it’s totally doable, especially since you’re already running half marathons. As for mile markers, no, there won’t be long lines for them, probably no more than 4-5 deep since people mostly grab selfies. There will be more spectators out for the half and full, though, with many of them offering to take photos. For the character photos, there will be heavier lines for the half marathon, and they could be heavy for the first half of the marathon, but for the last half – you’ll see much shorter lines since runners are in much-finish mode.